Off late, I had been rather busy in studies and certain complexities of life. In other words, the brain was too busy thinking whenever it wasn’t busy memorizing facts from books. The exam season is on and I was to write an examination in Delhi in the first week of January. As per my experiences about Indian Railways in the past years, I decided to board an overnight train to Delhi. 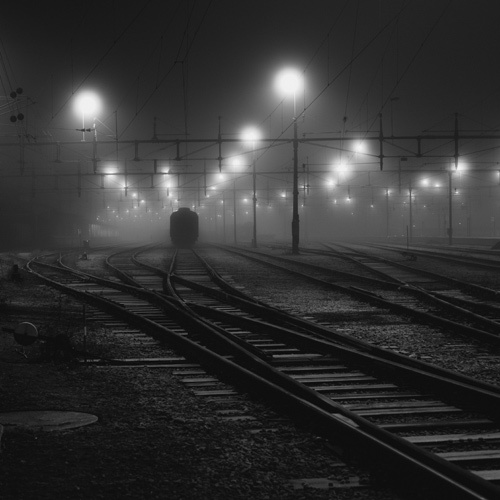 It has become a rule for the train services to be badly hit due to the winter-fog every year. So I thought it was better to spend the greater part of my journey sleeping rather than tiring myself out throughout the day sitting in a ‘day’ train. Strangely enough, the weather seemed to change for the good for two to three days before my planned journey. There was no sign of any fog, much to my relief. And it remained so until two hours before the departure. Just as my luck would have it, the fog came down in heaps as the clock struck nine. My train was scheduled to depart at 11:45. As usual, Dad had offered to drop me off at the railway station. But now with the ever increasing fog, we had to leave more than an hour earlier than usual because of the near-absent visibility. To add to my uneasiness, Mom declared that she would accompany us as well. I tried to reason with her about the intensity of cold and her vulnerability to it. But she was having none of it. So, we left home a good two hours before time. Contrary to our guesses, we reached the station rather early in spite of the fog. I told the parents to leave immediately for home as I took out my luggage from our car. The train was already on the platform and I told them that I would make myself comfortable inside the train right away. Mom reminded me to call on phone as soon as the train moved from the station. I hastily yes-yessed and once again told them to leave. Having said the customary good-byes, I entered the station, found my coach and got to my reserved berth. It was still about an hour to departure and so, the train was still pretty much empty. As I fixed my luggage at their proper places, I noticed an elderly couple sitting opposite to my berth. I noticed that they had already fixed their luggage and were sitting in complete silence facing each other on their berths. Having sat down, I decided to make use of the time and started with a book I had brought along for my exam. People moved around the aisle, searching for their berths and handling their luggage. But this elderly couple sat there in silence without so much as raising an eyebrow. I sensed a strange calmness about them that felt rather abnormal. I was well into the twentieth page of my book when my phone started to ring. It was Mom. Mom : You settled ? Mom : Is it warm enough there ? Mom : So, should we go ? Mom : Ok. We are going. Don’t forget to call when the train departs. Me : Huh... I said yes. I’ll call. Now go ! I closed the book. It doesn’t help much to read when I’m irritated. Why did they have to wait when I assured them I would be ok ? They always treat me as a kid. My thoughts were disturbed by a couple of porters who came up with huge suitcases and started to push them in beneath the berths across. The elderly man got up to make way and sat down besides his wife. A young man came up and checked the luggage, paid the porters and with a smile, requested the elderly man to look after the luggage for a while. The elderly man just nodded his head while this guy went out. So, I resumed with reading my book once again. It was time for departure when I saw the young guy standing outside the aisle door with a young woman (who was probably his wife). Suddenly, the train started to pull away as I saw them waving to people out on the platform. And I didn’t miss noticing how the woman suddenly broke down into tears even as the young guy tried to console her. As the train left the station, the young couple came inside and sat on the berth opposite to the older couple. The young woman was still wiping her tears amidst soft hiccups. Suddenly, for the first time since I entered the coach, I heard the old lady speak in a really calm voice. Old Lady : Were your relatives here to see you off ? Young Woman : Yes. Mine and my husband’s parents and his sister. Old Lady : Are you people going abroad ? Young Woman : Yes. We are going to Australia. My husband works there. Old Lady : I know it’s hard to say good bye. The young woman managed a wry smile. Old Lady : It’s ok. You should relax now. Young Woman : I know. But it’s hard. You won’t understand. There was a pause. A rather awkward one. And I was closely observing the people and their conversation. Suddenly the elderly man spoke up in a voice as calm as his wife. The old lady resumed in her calm self. I could see a faint smile on her face that was probably there since the beginning, but it felt more pronounced now. “I see.” The young woman said wiping off the final traces of wetness from her eyes. “So you people must be habitual of this by now. No ? Where does your son work ?” The young woman asked. It was once again the elderly man who spoke. And he spoke with an air of even greater calmness than his wife. There was a weird but eerie silence just as the man uttered those words. Though not being a part of the conversation, I was still equally, if not more stunned than the young couple. The old lady continued. That was when I saw the elderly man press at the hand of his wife. I felt that he knew he had to stop her. Though she still had that strange calmness about her face which also had that hint of a smile, maybe her husband knew too well where she was prone to break down. I was still trying to look into my book. But it was all too hazy. And suddenly, I remembered something. I got up to move towards the door of the coach. On the way, I saw tears rolling freely from the young woman’s eyes now. I took a deep breath as I came out of the door. The sudden chill outside the compartment made me gasp. I took out my phone from my pocket and dialed the number. Mom : Hello. Bhaiya,… the train left ? Mom : Is it warm enough inside ? Mom : Don’t keep awake for long and don’t keep reading in that dim light. Mom : And don’t forget to call when you reach. Me : Yes. I won’t forget. Beautiful beautiful post, Loved reading it, very poignant. I know I don't know why have I changed it and made it difficult for people, guess I just did. You said it exactly as it is. We will always remain kids for our parents. Don't know when and why we seem to stop enjoying that love. Yes. We keep ourselves busy chasing what we don't have and in the meantime, forget all the beautiful things that we have.